Clearly, Juan Amador is one of the best German chefs of the third generation and maybe the one whose cuisine has been most frequently misinterpreted and even misunderstood. Quite often, he was labeled as a „molecular“ chef. Some spoke of gimmickry or even a Kindergarden menu dramaturgy thanks to his opening and closing tapas comprising some liquid nitrogen here and there or the Szechuan button reset at the beginning, to name just a few ‚gags’ to entertain. This had essentially two effects: on the one hand, he received more press attention than the other three star chefs and could also build up a kind of personal brand that mainly stands for innovation. On the other hand, however, in the perception of the normal diner the tapas often overshadowed the ‘real’ menu that has always been a showcase of how serious a chef Juan Amador indeed is. 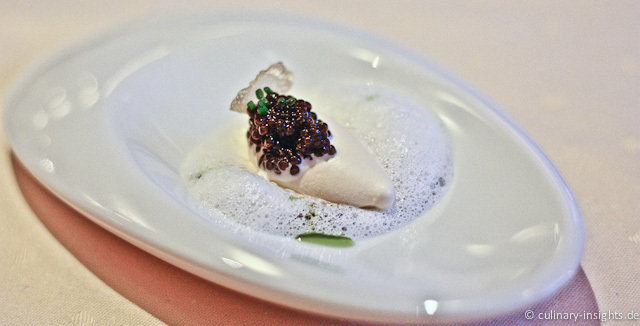 As I wrote in an earlier post, he shows how an essentially product-oriented cuisine can be modernized and taken to a higher level by combining seemingly unrelated flavors and using modern techniques only if they add value. Signatures like carabineros with nougat and cauliflower or the ingenious pigeon with mango, cocos and purple curry demonstrate that he is a master of flavor combinations, proportions and textures resulting in partly subtle and partly punchy dishes. 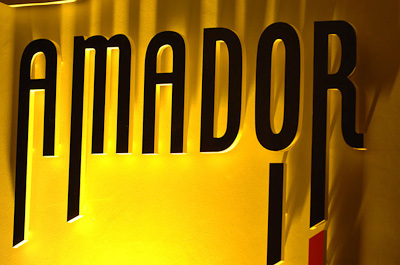 Moreover, his plates speak a very unique language – it is quite easy to recognize an Amador plate. The overall result is a modern product cuisine of its very own distinct kind! 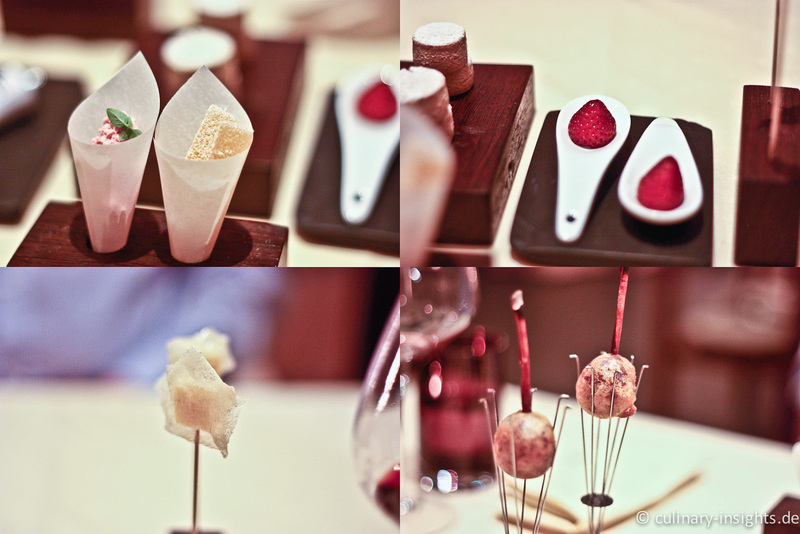 After some time I felt an urge to revisit Langen – from the menu on the website there were quite a few new dishes. Sitting at my table and seeing the actual menu, I was quite surprised: Mr Amador has changed the menu dramaturgy – some appetizers up-front, then five mainly cold courses followed by five warm ‘main’ course and five desserts, with a twinkling eye called Les Frois – Les Chauds – Les Desserts to emphasize the French roots of his cuisine. The appetizers (no, not the Micro Menu) were really delicious: sweet/sour marinated tomatoes of amazing intensity, a sashimi of Lomo Iberico (not pictured) that was salty and just yummy, a foccaccia served with Pancetta Iberica and some “pillows” with Cabrales, a Spanish blue cheese. I thought that the Cabrales would ruin the start as it is normally very strong but here it was in wonderful balance with the crunch of the pillows and had just enough strength not to dominate and yet set a first attention step. Excellent start. Les Froids started with the Iced Beurre Blanc that is more and more becoming an Amador classic. Although I was never really fond of this dish due to the fatty and dominant character of the beurre blanc ice cream, this time I was surprised how well it worked because of re-dimensioning. The smaller overall portion made the beurre blanc less dominant and yielded a nice accord of textures (malt bread, caviar and ice cream) and flavors (iodic, tangy, nutty and slightly sweet/sour). Excellent. When I first ate the Oyster Raviolo in April the proportions didn’t work that well as the soy was quite dominant and the whole dish turned out to be quite one-dimensional iodic. 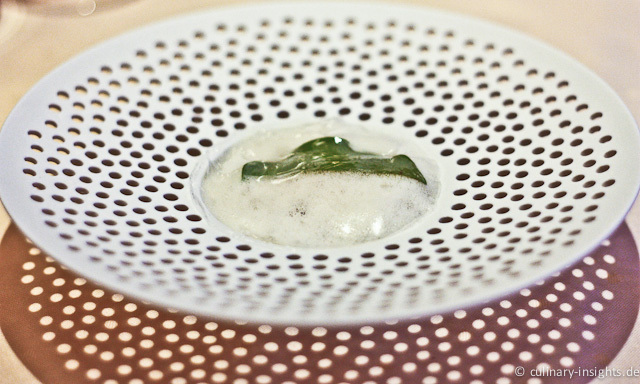 What a difference even small changes can indeed make – this time the yuzu air could kick in and brought balance to the dish. The oyster was rich, fatty, salty and truly outstanding whereas all the iodic character was repeated once in the algae and the oyster herb, sesame added some texture and the soy served as the grounding element. Outstanding. The neck of Müritz lamb is another classic Amador dish that was previously served as a pre-course before a lamb main. The tender lamb was incredibly tender (cooked sous-vide and the smoked with hay) whereas the combination of grassy and smoky notes with the sweet-sour rhubarb works amazingly. That’s a premier example of the successful marriage of not that familiar flavors. Excellent. The Gazpacho was a showcase of Amador’s product-oriented cuisine: an amazing quality of the langoustine was coupled with an intense gazpacho (one of the Amador recipes from the beginning in Langen) and flavored with mint and strawberry. As an almost “easy” and uncomplicated dish, this was really refreshing and served as a small palate cleanser after the strong and intense lamb. 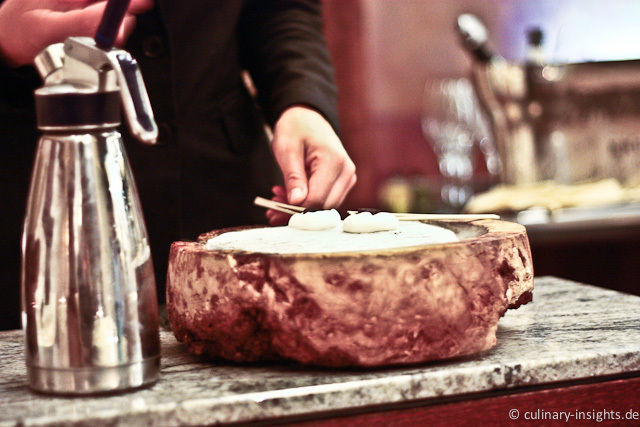 Here, Juan Amador shows a clever variation of the course sequence as most chefs would have served this before the lamb. Here, this works quite well and because it changes the order of savory and sweet dishes and makes the whole experience lighter and more enjoyable. In itself, Les Froids become a small menu within the menu. Amador had served both the tartar with mustard ice cream and the Strammer Max element (a quail egg wrapped in a small slice of toast) separately in the Micro Menu. 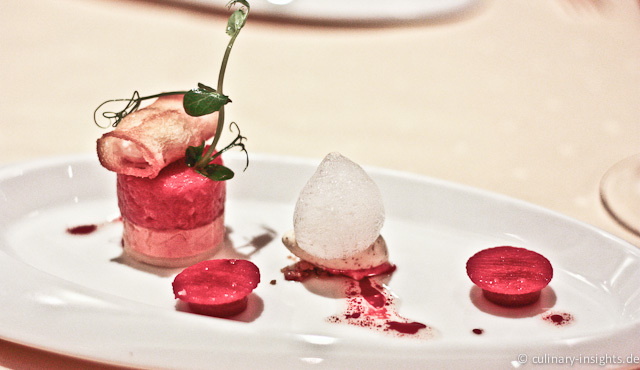 The combination is simply ingenious but needed additional elements as the jellied soubise on the bottom, the intense and creamy terrine of foie gras in the middle of the tartar tower. Together with the slightly sweet beetroot as the bridge between the former two dishes this was simply a masterpiece. Every single combination works, this dish simply had everything: a suspense-evoking gradient in temperatures (an element often neglected) between the warm quail egg, tartar and foie at room temperature and the cold mustard ice cream. Of course, various textures were involved and the aroma combination of foie, tartar, soubise and ice cream was just ingenious whereas the beetroot brought in some earthiness. Most interestingly, I found the different shades of richness quite surprising and maybe the central element of the dish: the egg yolk, the foie and the mustard ice cream, yet all creamy and rich per se, played ping-pong with other: ‘neutral’ egg, sweet meaty and not overall fatty foie and slightly spicy ice cream. Overall, despite the various elements, the brilliant tartar was still king in the ring. DIVINE! Served for the first time in 2009 (yet in a quite different version), the virtual asparagus is a showcase of intelligent modern cuisine as it uses molding where it really enhances the culinary experience besides the spectacular look. An intense asparagus cream soup is served in the form of an asparagus that intensifies the asparagus flavor immensely. This time, the combination with the splendid benchmark carabineros, Bachkresse (herbal and refreshing), small pancakes (Kratzete, a traditional side for asparagus in southern Germany) and especially the interesting slices of radish with added a slightly crispy texture and a sour counterpoint to the creamy asparagus and intense shellfish. Moreover, the small caraway caramel balanced out the dish in terms of texture and flavor. Last but not least, the interplay of the main plate with a bowl of an amazing asparagus flan topped with Amador’s intense shellfish bisque was truly noteworthy: as the main dish had no sauce and thus appeared really light, the creamy à part acted as the backbone and binding element of the dish that also ‘repeated’ the main flavors in different form. It is really imperative to eat both elements together. DIVINE! A new dish, yet the Mar Y Muntanya (sea and mountains) theme is very characteristic of Juan Amador’s cuisine. 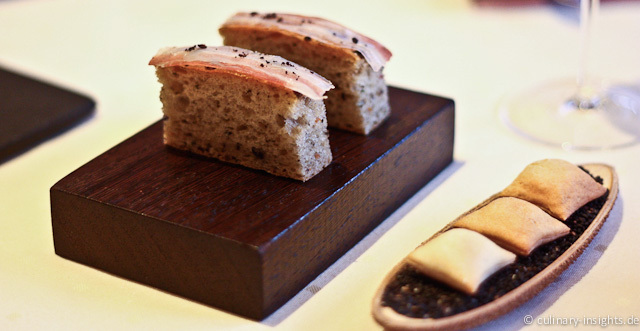 Here, he presented a very unusual dish construction: the fatty tuna belly on the bottom together with the beeftea serves as indirect aromatization for the protagonists foie and scallop that got along very well with each other. Notwithstanding, the foie was of excellent quality and impeccably prepared: cooked sous-vide and the Bunsen-burned to induce some roast flavors the result of which was crisp on the outside and firm on the inside. Excellent. At first glance, the Turbot Parfume de Siam is a very familiar flavor combination of green curry and cocos as served in many Thai restaurants. 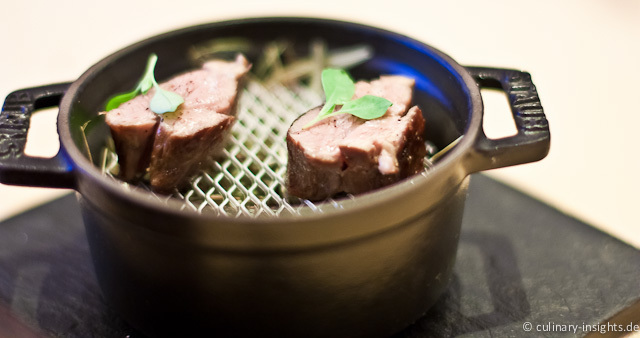 But Amador managed it to elevate this to three star level by sensibly working with the green curry as a basis note, enrich it with the cocos and then adding duck tongues as a surprising element that provided some slightly sour contrast and interesting texture. Needless to say that the turbot was perfect. After the complex two starters in the main menu this was just to indulge without overly analyzing each element. Excellent. 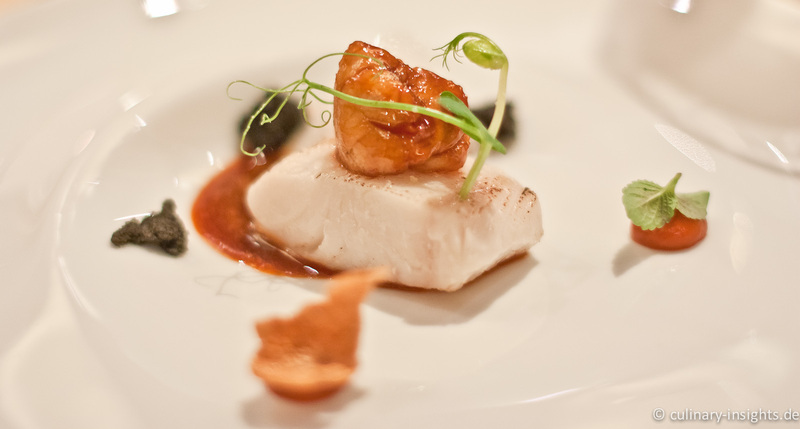 Next up was one of my favorites of the night – black cod: what a punchy dish, a real winner. The bell pepper jus is the real star here being of amazing intensity and combining the sweetbread and the black cod that was slightly roasted on the outside. Outstanding. The ‘real’ main dish arrived as the last of Les Chauds, a wonderful pigeon from Claude Mieral (the best in the Bresse). Charcoal-grilling becomes more and more en vogue these days even at the very top restaurants. Amador just got his new toy build-in and really pays off: I must say that this pigeon was one of the best mains in Langen for some time. Especially the accord with the marinated peach worked very well whereas the pigeon was of superb quality and masterly prepared. The interplay of the different sweet notes of peach and nougat (in the jus) was enlightening with the pigeon serving as the centre of this nice improvisation and the chanterelles bringing in rustic and earthy counterparts. Perfect and in equilibrium – outstanding. Maybe the most surprising and unconventional part of the menu: A small piece of Guanaja ganache, marinated cherries wrapped in smoked ham from the Black Forest. Unusual but it worked very well and yielded a refreshing, intense and just yummy small bite. Outstanding. Beautifully arranged (do you recognize the small mouse? ), this first main dessert is quite delicate but a bit one-dimensional as the blanc manger and the almond ice cream are too similar in texture and flavor. Moreover, there is not enough redcurrant to counterbalance the richness of the former two protagonists and to enhance the dish by adding more of a fresh touch. Very good. A nice interpretation of the famous Fürst Pückler ice cream combination of vanilla, strawberry and chocolate normally served as an ice cream cake. In a white Amador box he served a frozen vanilla air and dehydrated chocolate and strawberries in a separate small bag. To eat this one needs to spill the bag in the big box like cereal. The whole experiment is not only entertaining but also simply delicious as the flavors were really concentrated and intense whereas the vanilla air light and refreshingly cold. Excellent. Paul Haeberlin created this seminal dish in 1965 whereas he poached the peach gently in vanilla sirup, paierd it with pistachio ice cream and topped it with Champagne sabayon. In Illhaeusern, this classic is these days served as a pré-dessert in a slightly modified, i.e. re-dimensioned version. Still delicious I must admit. Amador, on the other hand, replaced the Champagne with Riesling and filled a frozen ball of Riesling espuma with a wonderful white (!) peach mousse and paired it with a pistachio jus, vanilla ice cream and pistachio crumble. The riesling worked much better than the more astringent Champagne yielding a more harminious flavor combination. The texture of the frozen espuma and the peach was a bit too similar, maybe a third more crunchy element would elevate this dish even further. Nevertheless, an excellent end of a outstanding menu. Some “petit fours” accompanied our coffee: tingly virtual raspberries, sour “french fries”, rich and yummy hazelnut cookies with wonderful Milchmädchen (sweetened condensed milk) crème, Joghurette and milk rice with glowing cinnamon. The new menu dramaturgy allows Juan Amador to focus the diner’s attention to the real menu, tell a story in one go and, for himself as a chef, to concentrate more on the individual dishes that turn out to be more puristic, reduced and to the point. With this ballet-like succession of well-placed sometimes subtle and sometimes punchy dishes in one menu he has successfully further sharpened his profile. Overall, Juan Amador has entered a new phase in his development – the creative “result” is very compelling and I must admit that never before I had such a virtuous, playful, delicate and at the same time light dinner in Langen. Mr Amador is in top form! Genial, señor! A must for every foodie! Sometimes it is just a pleasure to literally watch how a chef develops. Almost in slow-motion, dishes pass by and tell a story of modernization, of self-discovery… Like a sculptor a chef needs time to set his unique picture, his style free. At Français in Frankfurt, Patrick Bittner is a fine example how this evolution can actually happen. 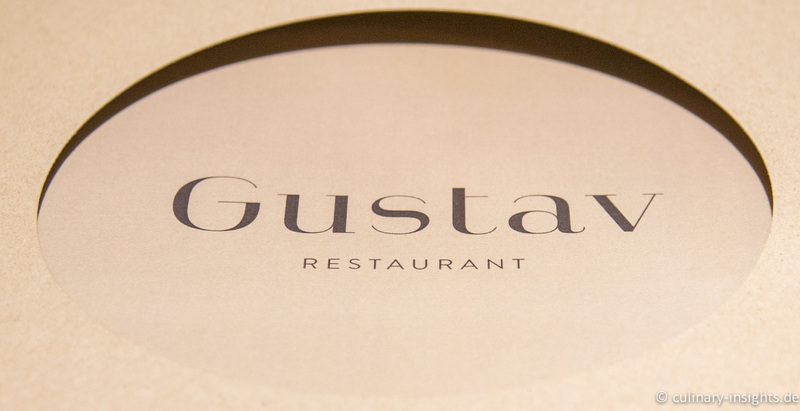 Having dined there in regular intervals (and increasing frequency I have to admit) one observation is clear cut: whereas his cuisine in 2008/9 was very good but rather classic the first star in November 2008 was a big turning point and milestone in his development. Bittner had been working towards this goal for some years – so the moment of liberation was quite substantial. How has this impacted on Patrick Bittner’s cuisine? Here the story goes: Sven Väth planned the whole Cocoon project for about three years, got to know Mario when he was chef de cuisine at Danube in New York and then, on Mario’s 30th birthday, Sven’s wife asked Mario whether he wanted to head the restaurants in the new Cocoon Club. This was the starting point of a quite unique gastronomic project. Silk is a bed restaurant – a bit inspired by the Supperclub in Amsterdam and the Bed Supper Club in Bangkok. But, to be honest, none of these is so consistent in its approach as Silk and offers Michelin-starred cuisine. Wait, Michelin has awarded a star to Silk (early in 2006), a restaurant without proper tables, proper table cloths and high-end cutlery and porcelain – in Germany? 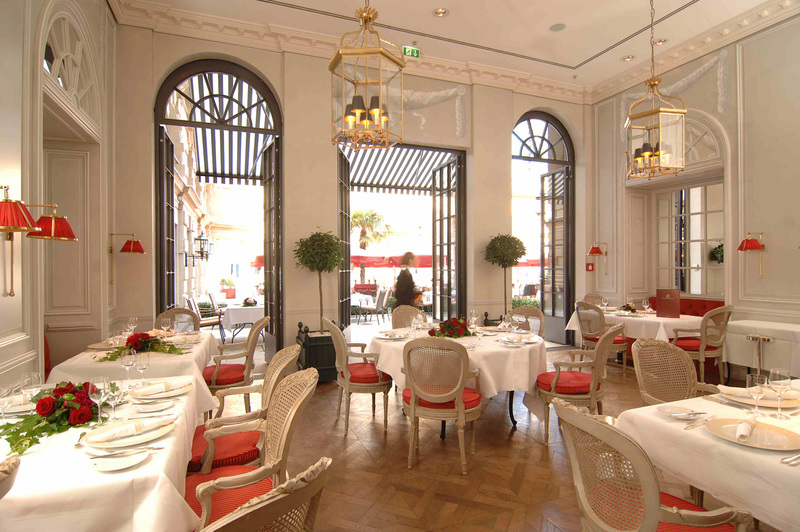 After the Guides had been out it was clearly time to revisit the Restaurant Français at the Steigenberger Frankfurter Hof, the only Grand Hotel in Frankfurt. 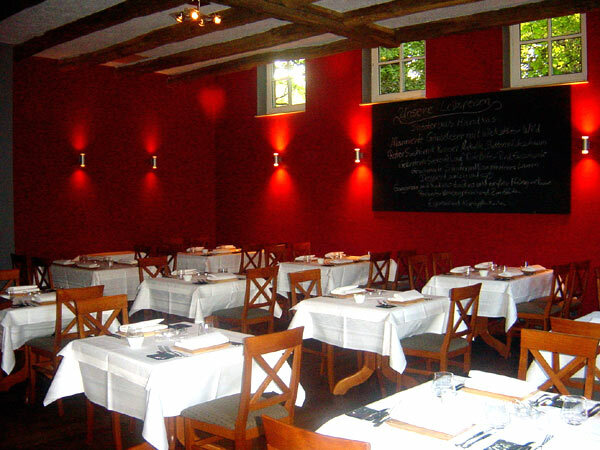 After the hotel and the restaurant have been renovated before the Soccer World Championship in 2006 Patrick Bittner, the chef de cusine at Français, had been cooking with new esteem but the brigade and very much the atmosphere stayed the same. Classic but nevertheless with a modern touch the new Français is far brighter compared to the old interior. It is clearly positioned as a business restaurant with a reasonable lunch offering and opening times only during the week. The audience is truly international – a good showcase of the diversity of Frankfurt’s guests… This clearly limits the array of culinary adventures a chef could possibly create here. Just keep that in mind when reading about the menu. There is a clear need to serve this audience. Ha, this is not a Frankfurt restaurant strictly speaking, you might say and you are right. Großfeld’s Gastraum der Sinne is located in Dorheim, a part of Friedberg about 20 minutes from Frankfurt. But, my files files intend to give you some orientation on your journey to culinary delights when you are in and around Frankfurt. Maybe the “around” enlargement is due to the fact that in Frankfurt itself good fine dining is rather rare. Finding this place is not as difficult as getting to Mugaritz or Extebarri but it is not too easy. Unlike for the former two a solid navigation will do. Be sure to bring a rather small car as parking space is limited. Interior of a German Michelin Starred Place? YES! From the outside it reminds me a bit of Amador as it seems to be a normal residential buiding, yet not as old and timbered as in Langen. The interior is much different then: you have basically one large room painted red equipped with bistro-like furniture. The service brigade is young and not as polished as usual making it overall a very pleasurable atmosphere. As I frequently hear it really takes away the fear of the unknown for people new to starred restaurants. A look around on a normal day affirms this as the average age is much lower and people are dressed up more casually. I stress that as it is important to attract new and younger people to our beloved restaurants which is accomplished here.